Yes, eating the sinful stall bought hor fun dish often make you feel ‘fat’ as it is usually cooked with the hor fun being deep fried beforehand, to make it more tasty and less sticking.. But for me, I wouldn’t waste so much oil to pre-deep fry the hor fun for my home cooking. Simply stir fry (with a little bit more oil than usual cooking) it! Of course, if you wanna make it more ‘authentic’, follow the deep frying method, with expect of higher calorie intake in mind though. (1) Heat non-stick wok with 1/2 cup (minus 1 tablespoon) of oil on medium fire. Loosen the hor fun and add to stir fry. Need not to constantly stir fry, but leave it to brown with occasional stirring. Add 1 tablespoon of light soy sauce and stir fry to combine well. Heat off and dish out. Reserve for later. (2) In the same wok, add 1 tablespoon of oil over medium heat. Add garlic and stir fry till aromatic (browning is not necessary). Add seasoned pork slices and stir fry till almost cooked. 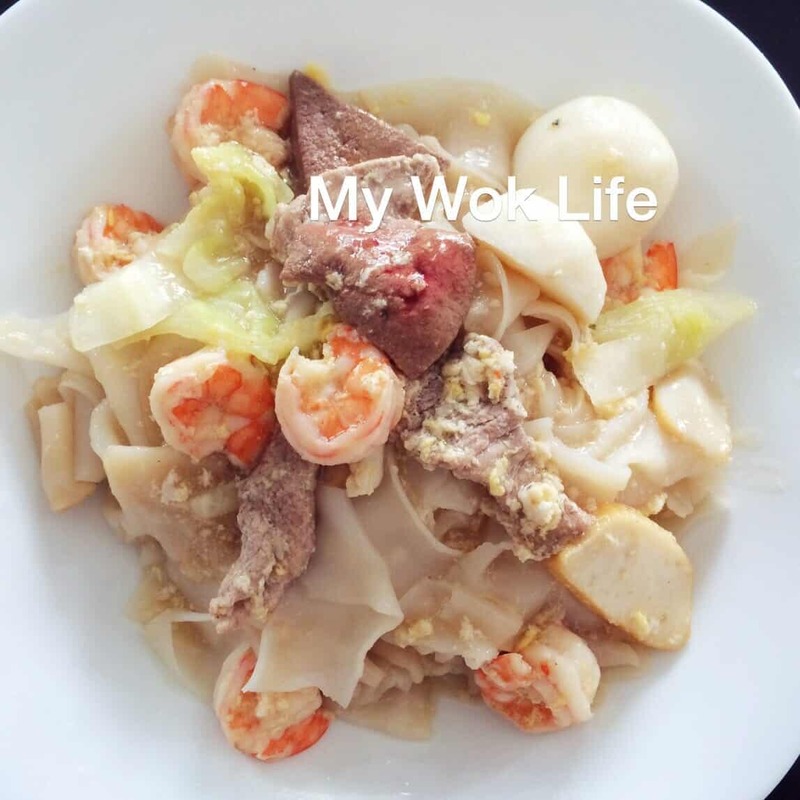 Add prawns, fish balls, fish cakes and cabbage and stir fry for 1-2 minutes. (3) Add water until ingredients are fully covered. Cover wok with lid and let it simmer for 3-5 minutes. Remove lid and add salt, sugar, fish sauce and pepper. Stir fry to combine. Break eggs into the wok and stir immediately to create egg drops effect. Add blanched pig’s liver. Before heat off, add corn starch slurry to thicken the gravy. (4) Divide hor fun into plates. Pour gravy and ingredients into each plate proportionately to serve immediately. If you find your home cooked hor fun dish is less tasty than the outside stalls, that’s because no MSG in your cooking. If you really wish to, simply add 1 tablespoon of chicken granule (get those without added MSG types), and that will make your cooking tastier yet healthier enough. I tried that. A portion of my hor fun dish counts about 450kcal. Tips: Broad type of hor fun is not commonly found at supermarkets. It is usually available at wet market instead. Look for those stalls which sell fish balls and tofu, they usually sell noodles including broad hor fun. I got it from wet market at Ang Mo Kio Central. Ask for $1 worth of amount would be sufficient to feed 3-4 person. 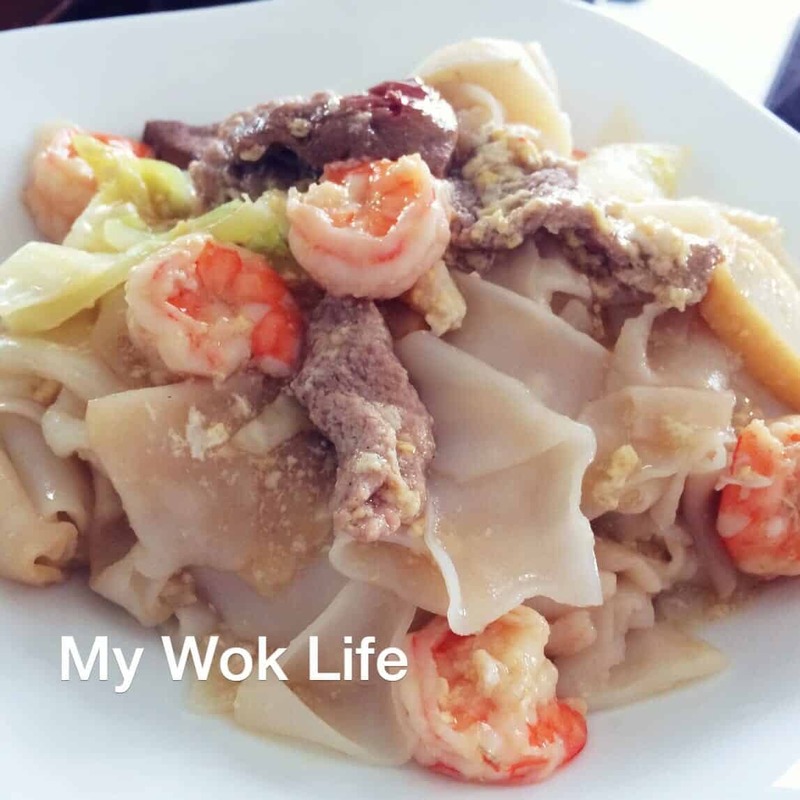 * In any case, if really unable to get the broad type, you may want to settle with the usual kueh teow noodle, if you don’t mind. But of course, expect less ‘spongy’ texture without the first choice, and it won’t do like you are cooking the local favorite hor fun dish though. * Blanch the pig’s liver separately beforehand is to prevent the liver slices from over cooking. Adding it last into the wok so that the liver taste will not affect or over-whelm the overall flavor of the dish. Well, adding pig’s liver to this hor fun dish is optional, after all. I love hor fun and love to try this. Thanks for sharing this!